A new Faunalytics blog looks at the past and present of advocacy for animals used in research, and offers context for potential future action. In 2012, I released the film Maximum Tolerated Dose, which I had worked on for the previous two years. I toured around the world with the film, doing both screenings and participating in protests/demonstrations at nearly every city where it was screened. The insights that I gained from directing and producing the film, touring with it and discussing it, as well as demonstrating, have given me a unique perspective on research animal advocacy that I’d like to share with other animal activists. Advocating on behalf of animals in laboratories can often feel like trying to hit a moving target, or at least a blurry one: the industries involved in animal research are secretive and opaque. Animal breeders and animal labs are often protected by regulations that allow them to operate behind closed doors and away from public scrutiny. They also benefit from a sort of scientific privilege, where scientists and researchers are often able to dismiss public concern about ethics as a lack of understanding by laypeople. In this blog, we’ll be looking at these obstacles and much more as we explore ways that animal advocates can make a difference for lab animals. The history of animal advocacy on behalf of research animals is long and full of countless examples of creative and effective work. Going back to the beginning of the modern animal welfare and anti-cruelty societies, some of the earliest forms of animal advocacy in the U.K. and the U.S. were against animal experimentation and vivisection. Anti-vivisection groups began forming in the mid-to-late 1800s, and some of the first anti-cruelty laws – and animal advocacy groups that exist to this day – were focused on fighting vivisection. In the mid-20th century, the attitudes around animal experimentation were quite different. U.S. government agencies and others would proudly showcase experiments on informational film strips as part of promoting scientific advancements. However, by the 60s and 70s, a sea change in animal ethics and philosophy, specifically the publications of Peter Singer’s Animal Liberation, and later, Tom Regan’s The Case For Animal Rights, would change many hearts and minds, often using examples of vivisection to get at ethical philosophies. Fast forward to the 1980s and 90s, and I would be remiss if I didn’t also mention that research animals have been a particular focus for illegal direction groups such as the Animal Liberation Front (ALF) and groups that advocate more “grey area” tactics such as Stop Huntingdon Animal Cruelty (SHAC). Indeed, it is arguable that the current level of secrecy of animal research is a direct result of such campaigns in the late 80s and throughout the 90s and 2000s. While most advocates do not engage in such tactics, it’s worth noting that much of the earliest documentation of conditions inside laboratories came from ALF raids. Now, undercover investigations are much more common, and seem to generate much less contention within the movement and in press coverage. In the present day, research animal advocacy operates on many fronts. First, there are consumer actions such as animal-testing boycotts and awareness campaigns, as well as demonstrations to raise awareness about lab animal cruelty and thwart construction of new labs. Secondly, there are pressure campaigns directed at different facets of the industry, such as lab animal breeding and transport. Thirdly, there are organizations that advocate for the “Three Rs”: replacement of animals in experiments, reduction of animal experiments, and refinement of experiments using animals. This includes groups that are developing and advocating alternatives to using animals in research. Finally, there are academics who are using ethics as well as science to show that animal experimentation is not only wrong, but misguided and ineffective. One of the biggest problems with doing advocacy on behalf of lab animals, however, is that public opinion on the subject is splintered and clouded. 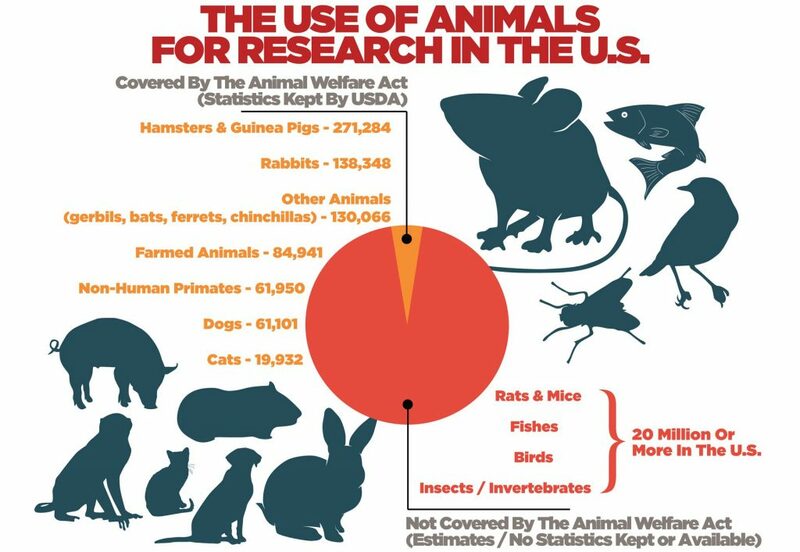 Part of this is due to the nature of the industry: animal research is secretive (both in practice and in the eyes of the public), and even when information is available, most of the general public is not trained in scientific language or procedures to be able to understand it. 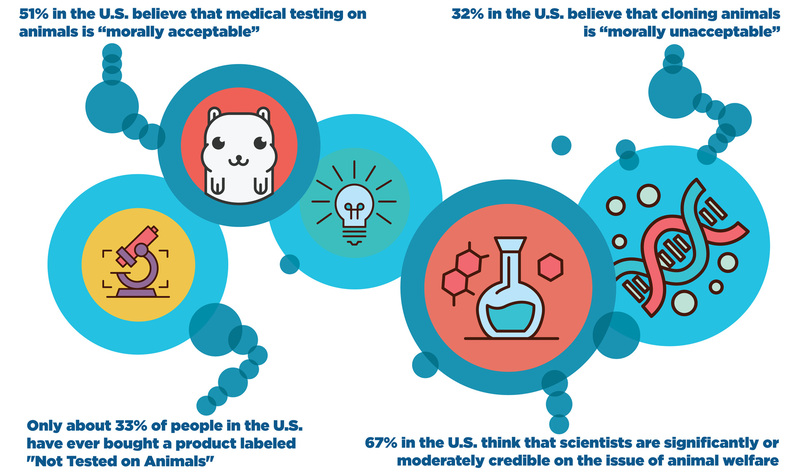 Our Animal Tracker survey and other sources show, however, that opinion in the U.S. related to animal research is splintered and a bit less simple. While a study from 2011 showed that 72% of U.S. adults were opposed to animal testing for cosmetics, our most recent AT survey shows that only 33% of people say they have ever purchased a product labeled as “not tested on animals” (although that number jumps to 42% for just women). When it comes to medical experiments, 67% think scientists are either significantly or moderately credible on the subject of animal welfare, which underscores a key problem: those trusted to be credible about animal welfare are those who are designing and conducting experiments on them. Underpinning this splinter in opinion is a scientific knowledge gap, which may be hard to bridge, and successful PR on the part of the animal research lobby. The old ethical question of “Who would you rather save, your child or a dog?” — as much of a fallacy as it may be — still strikes a chord with people, so much so that animal research lobbyists still use it in advertisements to manipulate public opinion. On both fronts, advocates may be able to step in to both inform the public on scientific practices and procedures, and also inform them about the actual tradeoffs of animal research outside of the “child vs. dog” fallacy. Indeed, many groups are doing such work on a daily basis. The debate about animal research has stayed contemporary and in the public consciousness for decades, thanks to a combination of factors. It many ways, it is not an organized effort or a “campaign” coordinated by all actors involved, but rather involves many different actors working in concert to make change. Advocacy groups such as PETA, CFI, and HSUS help to push the issue by continuing to release investigations exposing the horrors of vivisection, and underground groups create splashy media moments by actually breaking into labs and rescuing animals – though this has slowed in recent years. Corporations such as the Body Shoppe, Lush, and others play a big role in mobilizing and engaging consumers on the issues. At this point, cosmetics testing using animals is banned across the EU, and in other places around the world; companies such as Lush are carrying the torch forward in a big way, refusing to test their products on animals, supporting anti-vivisection campaigns, and with their foundation of the Lush Prize, which lauds scientists working on research alternatives, and more. However, I would argue that cosmetics testing represents only minority portion of the industry, and perhaps even only a small minority. I believe the majority of animal research is done at the university level to generate data and publish papers, or it is done as part of the biomedical industry, which will always be a shaky ground on which to boycott. What’s more, there is a great deal of animal experimentation being done at the behest of government agencies, or with government funding. That being said, it’s nearly impossible to determine the proportion of animals are used for cosmetic testing and those used for biomedical or other research. For argument’s sake, let’s assume cosmetics testing represented 50% of the industry… what do we do about the other half? There is very little we can do to boycott a university doing locomotion experiments on dogs or monkeys, and it’s hard to imagine that many heart patients would boycott a medicine that was brought to them after animal trials. Yes, we may be able to protest at universities and ask them to change policy, or pressure them to be defunded, but there is little precedent for such protests having an effect. Understanding this, many advocates around the world have turned their attention to placing pressure on different parts of the industry, the most public pressure campaigns being those targeting lab animal breeding and transport. The lab animal transport campaigns that have emerged in recent years, spurred by investigations from groups such as CFI and others, have shown relative success. Currently, only three airlines in the world – Air France, ABX Air, and Vietnam Airlines – will transport monkeys around the world for vivisection. The future of animals used in science, and for other forms of experimentation, may depend on the balance between advocacy and scientific discovery. Firstly, advocacy will always have a place in any animal issue and animal experimentation is no exception. Whether it is pressure campaigns targeting primary, secondary, and tertiary industries related to animal research, product boycotts (when possible), advocacy for change from within academic institutions, or advancements in philosophical / ethical understandings, animals in labs need animal advocates. We must continue pushing for changes, even when the potential victories are small, and keep the issues in the public consciousness. Many people in my generation remember the “against animal testing” campaigns of our youth, and spent many years believing that issue had been “taken care of,” which is still not the case. Secondly, scientific discovery will play a crucial role in reducing the “demand” for animal research. Part of that discovery will include scientists and institutions auditing themselves and each other, digging into the data and scrutinizing the effectiveness of animal research. Some scientists have already begun to do this, with startling results. The other part of scientific advancement will be to continue to push the field of alternatives forward, including computer modeling, in vitro studies, “organism on a chip” research, and much more. Advocates can contribute to this indirectly by helping to fund organizations doing research alternatives and by informing themselves about research alternatives to help educate the public. For more information on laboratory animals and some statistics on lab animal issues, check out our recent Faunalytics Fundamental on Research Animals and browse our library with filters set to give you research related to animals used in science.